Well, it's been a quiet week here at The Inn. . . .
We took down the Christmas decorations last Monday. What? No, we are not late. We are, in fact, a week early. . .Candlemas isn't until Monday. And we have been practicing for the final Burns Supper and Ball of the season this Saturday, i.e., this evening. I like to play a few Burns tunes for the Haggis procession and for the Grand March and they often don't get much of a look in the rest of the year. So annually I dig them out and try to reinsert them in the annoyingly unco-operative memory. And there are always some new dances to learn. Hmm? Work? Don't be daft. Some military piping this week. This is from a 1998 performance of the Edinburgh Military Tattoo. Alas, none of those Scottish regiments still exist as independent regiments, all now battalions in the new Royal Regiment of Scotland. The announcer gives the names of the tunes. Today is the actual Robert Burns' birthday. His 250th, indeed. I played for the SGV - RSCDS Ball a week ago Saturday and I'm playing for the L.A. / O.C. RSCDS Ball next Saturday. But today is the day itself. Who boldly speaks of Robert Burns. Simply not to call him Bobbie. They dandle him like a Scotian kewpie. So there. There's more but that should be enough to duly chasten those of us treating the Scottish bard with unwarranted southern Californian familiarity. And it provides an excellent opportunity to quote Ogden Nash. To read Tommy Hardy and Bernie Shaw. Alex Gandy at the 2009 WinterStorm Meeting playing a march, strathspey, reel, hornpipe and jig: John MacColl's March to Killbowie Cottage, Cabar Feidh, Neil Angus MacDonald, Joe McGann's Fiddle, and Angus John MacNeill of Barra. The excommunications have indeed been lifted. 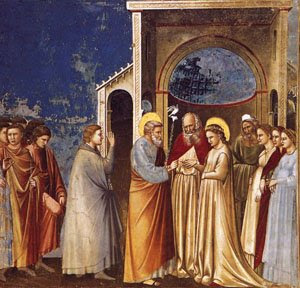 In the old Carmelite calendar, today was once the feast of the betrothal of Our Lady to St Joseph. Desponsatio tua, Dei Genitrix Virgo, gaudium annuntiavit universo mundo : ex te enim ortus est Sol iustitiæ, Christus Deus noster : qui solvens maledictionem, dedit benedictionem : et confundens mortem, donavit nobis vitam sempiternam. Just like when the boarding house blew up. . . .
. . . .roomers were flying. The papish corner of the web is awash in stories that the Holy Father is going to de-excommunicate the SSPX bishops practically immediately if not sooner. And, in his own inimitable fashion, Bishop Williamson tries to make sure it won't happen. Mr K. But what about the Reconstruction Finance Corporation? Aren't they supposed to help out? Mr R. Oh, sure. they keep right on lending money -- good jails and bad. No matter what happens. Mr K. Let me get this straight. The Reconstruction Finance Corporation just keeps on lending money? Mr R. That's right. On condition that there's no security. Mr K. Well, whose money is it? Whose money are they lending? Mr K. And lend it to the bad banks. Mr R. Now you've got it! The annual March for Life took place yesterday in Washington. We know this because we read it in The Times. Once we got to page 12. Click here to learn what they had to say on page 12. What did make the front page of The Times this morning? Why, this year's Academy Awards nominations, to be sure, an article on the newly anointed president's devotion to his Blackberry, and a sad story on the Santa Ana Zoo which is running short of monkeys. By the way, if you are going to read The Times, there is a special lexicon for proper interpretation. Pro-life people are "abortion rights opponents" and pro-abortion people are "abortion rights advocates". It's all about rights advocates and opponents. The people who support the babies' right to life are "rights opponents" and the people who oppose any rights the babies may have are "rights advocates". Be sure to get that straight. Elsewhere, we read that the Sainted One still plans to spend our money to kill foreign children. It's in the Wall Street Journal here. But he wanted to be "sensitive" about it and not sign the order on the Roe v. Wade anniversary. The mind reels. I suppose we ought to be thankful for any sensitivity we can get. But I suspect most pro-life people would willingly swap the lives of the babies for the insensitivity: feel free to excoriate us but don't sign the executive order at all. And you may have noticed that the WSJ also has a precious vocabulary of its own. That's why a rule which forbids giving American money to China to pay for forced abortions on terrified Chinese women is referred to as the "Family Planning Gag Rule". And I have contracted the flu. Let's celebrate: send a couple of bucks to these folks by clicking here and a couple more to these folks by clicking here. . . .And Some Have Politics Thrust Upon Them. This arrived in my mailbox this morning: an invite to The Obama Book Club. Really. I swear on a stack of bishops. You could click the link and see for yourself. One More Thing. . . . This is one of those days that is being nibbled to death by ducks. I need to be practicing a couple of sets that I'm to play for the SGV Burns Ball this Saturday, i.e., the day after tomorrow, the marketing needs to be done if we're to have anything in the house for the supper this evening, bills need to be paid and the desk, and, indeed, the office itself (the hub and command post of The Inn at the End of the World) need to be cleared up in order to find the herein above referenced bills, and a couple of other things which I need to look up on my To Do List before I can list them here. Instead, I have spent the morning with a wonderful biography of George S. Kaufman to the tune of about 70 pages in. We're already up to meetings of the Algonquin Round Table. Perfect timing. I detest biographies that spend inordinate amounts of time on the grammar school years of someone who wasn't actually interesting until he was 35. Today is the feast of St Ita who was Irish but who appears to have had more churches named after her in Cornwall than in Ireland. 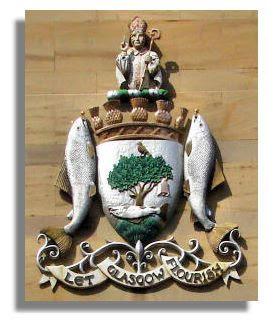 Kentigern, resplendent in mitre and staff, is emblazoned on the coat of arms of the city of Glasgow. Displayed with him are the bell that announced his services and one of the "trees of St. Kentigern" that, as late as 1500, were a landmark in the title deeds of the city. Ireland claims that Thenog, Kentigern's mother, was Irish. According to the legend, Thenog was cast adrift in disgrace in a little boat "made after the fashion of the Scots." She was carried in safety to a sandy beach in Fifeshire and there was born the boy destined to be the first bishop of Glasgow and one of the chief patrons of Scotland. St. Servan, or Serf, became the protector and instructor of mother and child and from him Kentigern received the term of affection, "Mungo." Thenog was also to win a place in Scottish Calendars. St. Enoch's (Thenog's) Square in Glasgow was named from the church dedicated to her. It was demolished in the Reformation. Kentigern is believed to have restored the church founded earlier by Ninian in Glasgow. It was there he built his cell around which disciples gathered and in St. Ninian's cemetery he planted the famous Glasgow trees. The king and clergy, seeing in the saint someone to build back the ruins of Ninian's work, '' called a bishop from Ireland after the manner of the Britons and Scots of that period" and Kentigern was consecrated bishop. Disturbances later on sent him into exile. After a stay, as abbot perhaps, at St. Asaph's in north Wales and a visit to St. David's at Menevia, he returned to his missionary labors in southwestern Scotland with Glasgow his chief center. An episode of note was the exchange of croziers by Kentigern and Colmcille, a very formal pledge of friendship. O God, who wast pleased that through blessed Kentigern, Thy Confessor and Bishop, the light of the true Faith should shine forth brilliantly: grant, we beseech Thee, that, by faithfully following that which he preached and taught, and by solemnly celebrating his venerable Feast we may attain unto the splendour of everlasting Light. Through Christ our Lord. Amen. Should that first line really be "That's he. . ."? I did think about it for a while. Predicate nominative and all that. But in the end, I decided to go with "him", colloquial though it be. "He" sounded a bit stilted, even for me. If you prefer it, though, feel free to read "he" rather than "him". . . .comes on a Tuesday this month. It's also the feast of the Baptism of the Lord in the traditional Roman Rite. And the "birthday into eternal life" of St Hilary of Poitier. And according to my handy pocket almanac, on this day in 1854 "Anthony Faas of Pennsylvania patents the accordion." In his honour, herewith some reels on the accordian (and a bit of good dancing to watch since it is on You Tube, after all. As long as we're paging through The New Yorker. . .
"It's good to see a really disastrous film every now and then; it makes one appreciate the modest victories of people with the skill to make a decent movie." Indeed. Truth through juxtaposition. I've always said nothing makes one appreciate Catholicism like Protestant funerals. Sorry, Protestants. Not very ecumenical, I know, but there you are. I find them unspeakably depressing. No grace, no sacrifice, no prayers for the dead; even the Novus Ordo does better. I can't find a cite for that quote on the website but it's probably there somewhere. They seem to put complete issues on the web. Or you could buy the January 12, 2009 number and look on page 7. O.K., like, some political bits and pieces are still interesting. You know. Like this one. Apparently Caroline Kennedy is an honors graduate of the George W. Bush School of Elocution. The New Yorker put this one in the "Eliza Doolittle Dept." Not life in general, but a sort of "great issues" boredom. I was talking with a friend over the weekend and we had both come to the conclusion that we really didn't give a toss about one of our main topics of conversation: politics. Why would that be I wonder. Perhaps the last year or more of non-stop political reportage over loaded the circuits in that portion of the brain devoted to the public polity. Or maybe a touch of despair over the prospect of the most anti-life federal government in our history (more so even than Bill'n'Hillary!) coming into power in a few days. And when the rigging in our fantasyland democratic system, always something of an institutionalized con game, becomes so much more obvious, well, it doesn't help. You don't have to be in Illinois to see it; a good look at the California legislature will do just as well. That part which laws or kings can cause or cure."